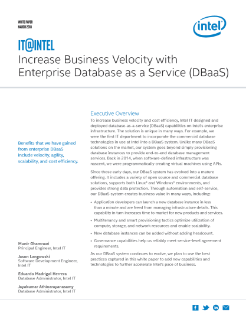 To increase business velocity and cost efficiency, Intel IT designed, and deployed Database-as-a-Service (DBaaS) capabilities on Intel’s enterprise infrastructure. The solution is unique in many ways. For example, we were the first IT department to incorporate the commercial database technologies in use at Intel into a DBaaS system. Unlike many DBaaS solutions on the market, our system goes beyond... simply provisioning database instances to provide end-to-end database management services. Back in 2014, when software-defined infrastructure was nascent, we were programmatically creating virtual machines using APIs. Get innovative ideas, best practices, and groundbreaking IT strategies from the experts inside Intel’s own IT department.